Necklaces are one of the fondest pieces of jewelry worn by people all over the world. Typically, it is a piece of jewelry worn around the neck, frequently formed from metal chains, with a locket or a pendant as an attachment. Many people have a particular interest in the type of necklaces that contain rocks or gemstones of different shapes and sizes. 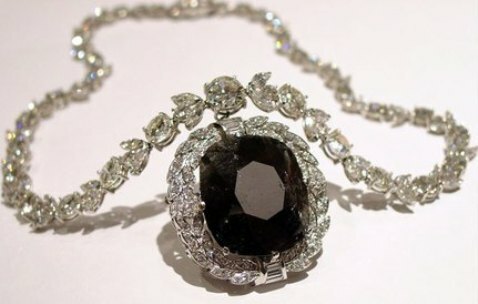 One such example is the Black Diamond Necklace. Black diamonds are the blood brothers of those dazzling and brilliant diamonds. The only difference is that they are black and don't shine and sparkle as much as their brothers do. As they are black, they absorb light instead of refracting it. Mind you, though, they are as real as those brilliant diamonds. What makes them very different is their crystalline structure. A "regular" diamond's crystalline structure is made like windows: light comes in, is refracted in and bounced out giving that dazzling, shining effect. Black diamonds, on the other hand, have what they call a "polycrystalline" structure, which is a less organized crystalline structure, or to put it simply, similar to hundreds of diamonds smashed together. Since the insides of black diamonds have no "windows" so to speak, light is not bounced off and instead just gets absorbed. Although initially believed to be a non-appealing stone, the rate of the popularity of black diamonds has been skyrocketing recently as it has been a favorite of many jewelers. Black diamonds look perfect with their jet-black color alongside shimmering diamonds, or a glossy silver layering. The perfect and most favored pieces of jewelry adored with these diamonds are the Black Diamond Necklaces. Black diamonds are real diamonds, and with their rarity, to receive one is to receive that high level of being acknowledged as luxurious or, for a person, highly important. It has been the perfect gift for classy women, and men have never been wrong when they gave their women diamonds - especially the rare kinds. Throughout time, the fashion scene has always been in sync with the color black. Black dresses, black bags, black boots - even underwear looks good when it's black. Recently, the kickoff from main jewelry companies of their patented black diamond necklaces and jewelry showcased the final addition to the world of fashion. These jewelry moguls have presented necklaces and other pieces of jewelry adorned with the magical and alluring black diamonds. The interest and allure of black diamonds began being seen during the '90s and have recently been renewed with more vigor as we see celebrities flaunting their black diamond jewelry on the red carpet. Various types of black diamond necklaces are available online and in jewelry stores: small drop necklaces, ribbon necklaces, wish bone necklaces, and collarets. These are but a few of the readily available designs of black diamond necklaces you can see in jewelry stores. With enough creativity (from both the buyer and the jeweler) and cash, one can create the most suited and most sophisticated black diamond necklace that will fit perfectly in a woman's neck. Today, as the fashion line between men and women goes ever thinner, the availability of diamond necklaces and other jewelry has been made available for men, as well. Men may choose to obtain some classy "blink" adorned with small to large pieces of black diamond in them. Some men who wear dog tags enjoy adorning them with black diamonds, as well.